Inside A Moms Purse - What Doing Mommy? Yep; I got ALL of THAT in the bag. I had no idea it had accumulated in such a way. The other day I went in search of a pen and after 3 failed attempts (crayons, epipen, and a spoon) I decided I would dump everything out and purge my purse!!! I did finally find a pen albeit a non-functioning glittery-silver one at the bottom of the abyss. In the middle of my sort and purge I realized that once again I was faced with yet another thing that has changed since I had children. Yep…I’m blaming the little people. Before kids I LOVED carrying a purse. I had/have several in all sorts of colors. Not too big not too small and definitely NOT too flashy. 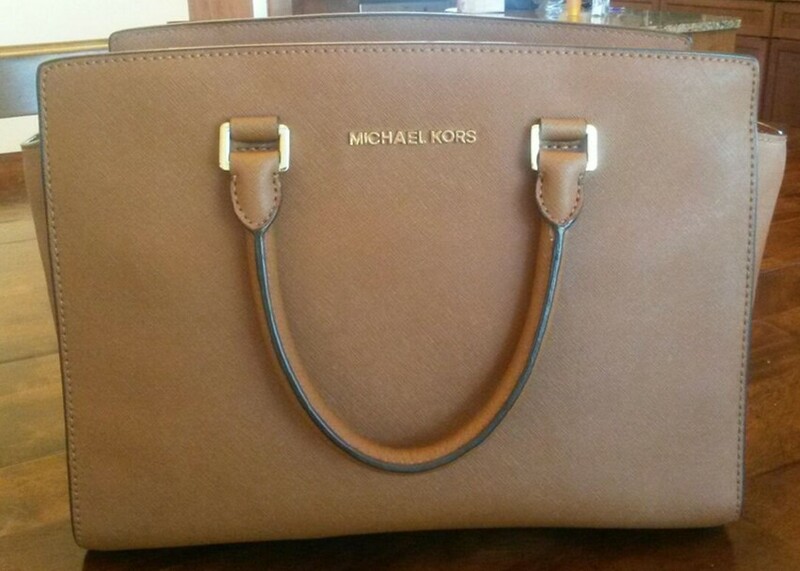 Knowing this my hubby bought the above purse for our 3rd anniversary (the year of leather) and I loved it. My daughter was almost 2.5yrs old so I had ditched the diaper bag and was excited to carry a purse again. What I didn’t realize was even though I no longer had to be worried about hauling diapers and wipes there were many child accessories that would find a home in my purse. And now that I have a second child even more items have made their way inside. You can’t be caught without snacks, a spoon to eat said snacks, Band-Aids, extra hair ties or sanitizer. These are all those things I had gotten burned by in the past when I didn’t have them…so I know. Then there are the “melt down preventative” items like stickers, crayons and Go Fish playing cards. You just never know when there will be an unexpected delay somewhere and you need to keep a toddler busy. You peep the beads? Yea. That’s a crafts project I’ve been meaning to start or finish (however you prefer to look at it) for forever. The epi-pen is a must for obvious reason. And the tissue…yea that’s a brand new pack plus an old used tissue stuffed inside. I won’t confirm or deny whether the old tissue has been used more than once. There is a hodge podge of things that all make sense. I managed to throw in some personal items of my own too! Bandaids – Keep about 5 in the purse. The smallest boo boo gets the biggest cry and for some reason a colorful bandaid makes it all better. Tylenol/Advil – TRUST. You need both with two children. Sophie the Giraffe – Every drooling/teething child appreciates one. Sanitizer – 3 words. Boogers. Poop. Snot. 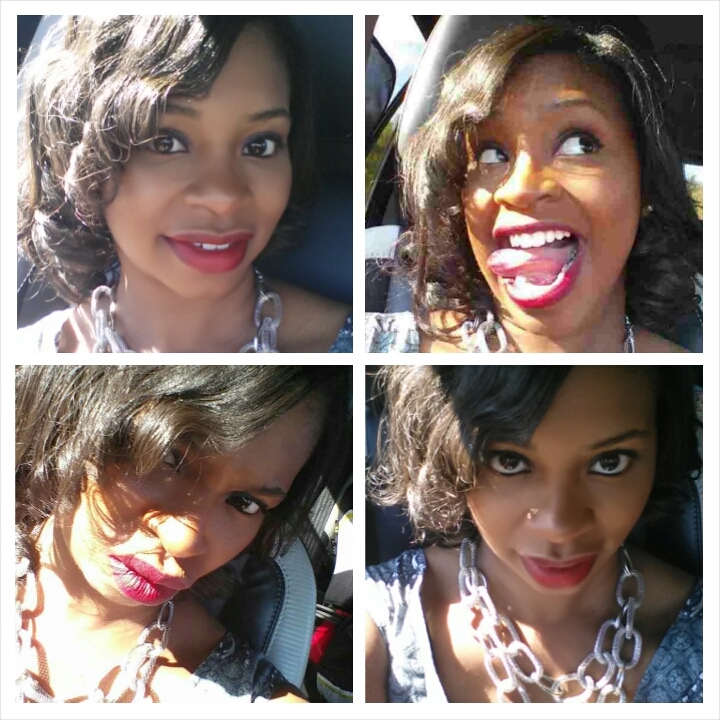 Plain Ol Trash – because every one knows all trash gets handed to mom! 3 Wallets – No words! Come back to me on this one. Sunglasses – because one day I will be cool again! Dah well I think you get the point. 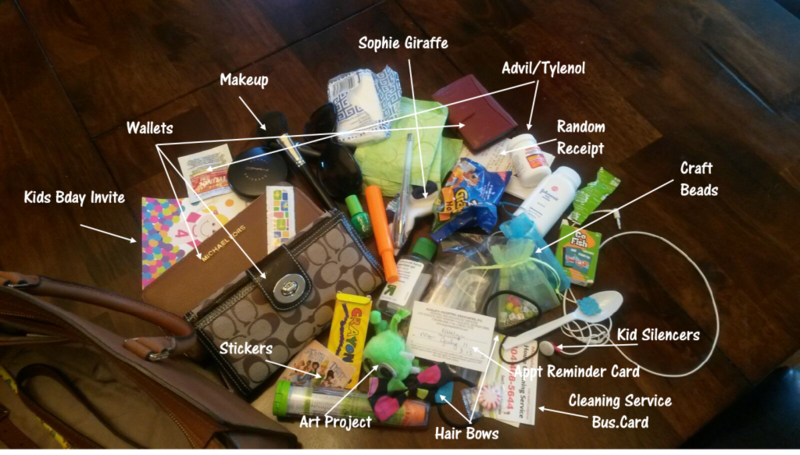 A mom’s bag, if she is fortunate enough to carry one, can be one big make sense mess! I cleaned mine out but at least one-third of these items went right back in the bag. Do you carry a purse? What’s in your bag? I’m scared of what my purse will look like once my LO arrives! 🙂 I can’t wait to compare notes!! Ha! I laughed at the 3 wallets but I totally get it! Great post! Thanks for stopping by and reading Kiersten! I have promised myself that I will eliminate at least one before the end of the year. LOL. Lol! Band aids do make everything right in the world again. Candice it used to come like clockwork BUT I was on hormonal birth control. With Paragard (nonhormonal) and now with NO birthcontrol (sick of it all) it comes every month but not a regular every 28days as I was used to. I have an app to track and it will tell me 5days till AF and it will come in 2days or maybe 7days. I no longer have any cramping as a sign just happens so I stay prepared. Its weird.